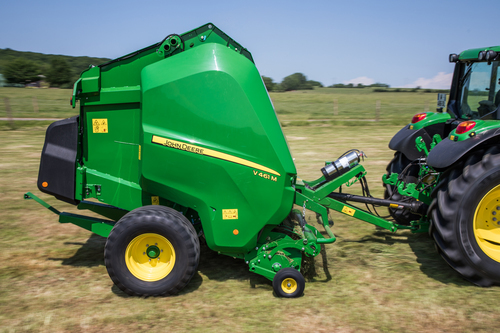 John Deere is introducing a complete range of new V400 Series variable chamber round balers for the 2018 season, to replace the existing 800 and 900 Series models. These high capacity balers have been designed to work more efficiently and productively in all crop conditions from wet grass to dry, brittle straw, offering farmers and contractors increased versatility and ease of operation. Key features include a durable, extra heavy duty welded frame and a proven feeding system with a larger diameter pick-up and one-piece in-line auger rotor for improved intake and crop flow. Heavier duty components such as bigger drive chains, oversize roller bearings, a new bale density tension system and Hardox steel rotor tines have also been incorporated in the new designs. The V451G is a basic specification, entry level baler primarily for use in hay and straw, while the mid-specification V451M and V461M multi-crop balers are ideal for medium to high volume use where the focus is on producing uniform bales as quickly and consistently as possible. The V451G has a four tine bar pick-up with 5mm tines, while the two M model balers also offer the option of a heavier duty, higher capacity five tine bar pick-up with 6mm tines, which is standard on the R models. High volume, high quality and premium specifications are the key features of the V451R and V461R balers, which have been developed to meet the high output requirements of contractors and larger livestock farms. As introduced on the 900 Series round balers in 2012, the revolutionary Fast Release System (FRS), in combination with the high capacity intake rotor, is capable of producing more than 140 bales per hour. The range’s new concept bale chamber combines six smooth pattern belts and three aggressive chamber rollers for true multi-crop capability and reliable bale starting in all conditions. There is a choice of net only or net and twine wrapping options, and all models are compatible with John Deere’s weather resistant B-Wrap system. A full width drop-floor unplugging system is standard on the M and R balers. This uses a unique parallelogram mechanism and is the widest on the market, enabling the operator to remove blockages instantly, from the tractor cab. Different BaleTrak monitors are available depending on model, with the higher specification BaleTrak Plus unit controlling the bale density and size, drop-floor unplugging system, soft core pressure and diameter and knife selection from the tractor cab. R models are ISOBUS certified and can be controlled from a GreenStar display in the cab.